This is a special Level 22 Thrall found in Old Russia in the Lunar Complex where the player first meets the Hive on Earth, and in the Refinery. This location can be reached via the Skywatch or the Mothyards on Patrol. Search the room for a small alcove with a pile of garbage; killing everything first is advised as the radar will help. Inside is the Servant curled up, partially concealed. He will get up when disturbed and attack. Killing him will summon multiple greenish portals, from which more Servants of the Hand appear, along with Cursed Thrall. 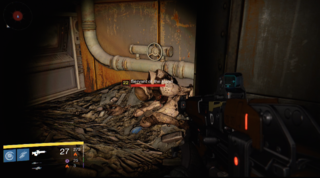 The Hand of Crota, a Hive Knight Major wielding a Cleaver, will also appear. The Thrall will keep spawning until the Hand is killed. Being killed will reset the process, and the original Servant of the Hand will not reappear, forcing a reentry. The Servant will be praying at a small portal of green Hive-energy. Killing it summons the Heart of Crota, a Major Wizard and several Hive Thrall, Acolytes, and a Wizard or two.